A new simulator has joined the ranks at the Mary Ekdahl Smart Center for Patient Simulation at Pensacola State College’s Warrington campus. Victoria, a maternal and neonatal birthing simulator, is the center’s 15th device and features full body supple skin and seamless joints. “Victoria is much more realistic. The mechanics of childbirth are more physiologically correct and because she has an upgraded motor, the entire delivery process is more natural,” said Marta E. Suarez-O’Connor, the education director for patient simulation training. According to the manufacturer, Gaumard Scientific, Victoria features the most advanced and innovative fetus delivery system. It allows her to simulate the natural movement of the fetus during childbirth. The fetus realistically dips and rotates. Victoria’s innovative birthing system is remotely controlled using a powerful yet intuitive user interface. The wireless simulator comes complete with a birthing baby which can be programmed to mimic the cries and mannerisms of a human child. Nursing instructors can even program the newborn to experience real-life emergencies such as breathing issues and other problems. Victoria also can be programmed for different birthing scenarios ­such as a cesarean section, breech delivery, shoulder dystocia, and for pre- and post-delivery complications such as pre-eclampsia and postpartum hemorrhage, Suarez-O’Connor said. Students also can administer medication with instructors monitoring the drug used and dosage. “During simulations, students become more engaged and get into the actual mindset of delivery because Victoria does more of what a real woman would do during the actual process,” Suarez-O’Connor added. 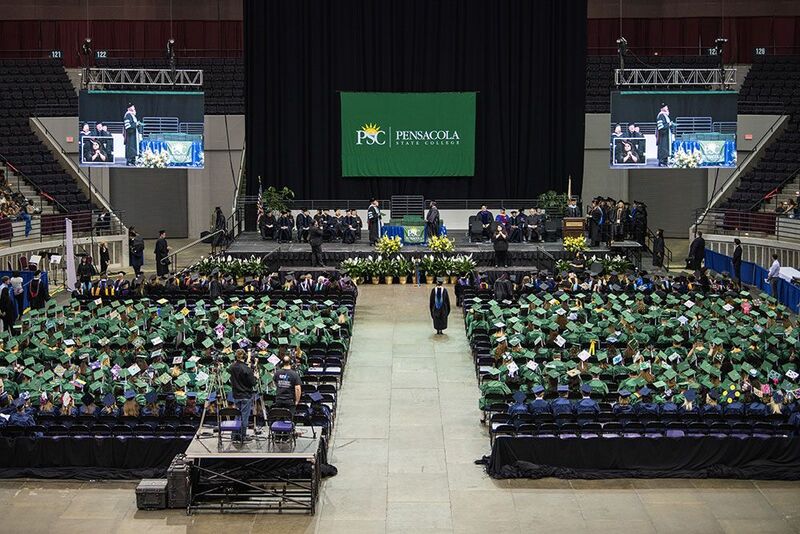 Between 140 and 160 Pensacola State nursing students will train using Victoria this academic year, Suarez-O’Connor said. Students must go through six two-hour scenarios with the simulator. Afterward, they go through a debriefing session where they discuss the sessions. Victoria, which costs $60,000, joins Noelle as the Mary Ekdahl Smart Center’s second birthing simulator. Noelle also is manufactured by Gaumard Scientific. The facility’s other high-fidelity simulators include: two Laerdal SimMan Classic, five Laerdal SimEssential, a Laerdal 3G, Laerdal SimNewB, Laerdal SimBaby, Neonatal Hal, and two 5-year-old Hals. The center also has Harvey, a cardiopulmonary patient simulator that can be used in small groups or a classroom setting. Opening in summer 2006, the Mary Ekdahl Smart Center for Patient Simulation Training and Research was established through a $1.3 million U.S. Department of Labor Grant, two state grants and a donation from Bill and Mary Smart. The approximately 12,000 square-foot center includes an emergency room, an apartment, an eight-bed simulation suite, three skills labs with eight to nine beds each, a fully-furnished birthing suite, pediatric suite, cardiopulmonary suite, debriefing rooms and custom recording systems that can broadcast live from archives to any audiovisual-equipped classroom. Along with maternal and neonatal scenarios, a variety of other “real world” clinical scenarios are conducted in the other simulation suites— ranging from a patient having a cardiac arrest to experiencing postoperative pain, to help nursing students learn clinical judgment and skills needed to care for patients. Dusti Sluder, PSC’s dean at the Warrington campus, said the simulators are invaluable tools for students. 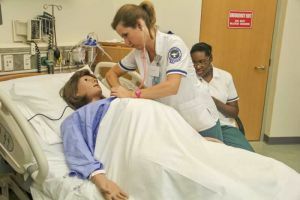 “Over the course of the nursing program, students spend more than 70 hours learning in the SIM labs — ranging from 10 to 36 hours per semester,” Sluder added.